When it comes to Poinsettias, chances are you have received one yourself or you know someone who has. The Poinsettia is a popular plant to give during the Christmas season with its brilliant show of bright red throughout the weeks of late November through January. The Poinsettia was first introduced into the United States by the first ambassador to Mexico, Mr. Joel Roberts Poinsett. In 1925, Mr. Poinsett (also a botanist) sent some plants to his home in South Carolina. He shared his finds with other plant enthusiasts. This beautiful Christmas flower has borne his name ever since. On December 12, we recognize Poinsett’s contribution to the holiday season by celebrating National Poinsettia Day. 1. Place your plant in indirect sunlight for at least six hours per day. If direct sun can’t be avoided, diffuse the light with a shade or sheer curtain. 2. 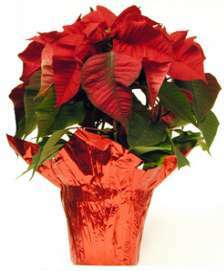 Poinsettias need moderately moist soil, water your plant when the soil feels dry to the touch. A good way to judge is to stick your finger into the dirt and if clumps of soil cling to it, the soil is still moist. 3. Provide room temperatures between 68 – 70° F.
1. Don’t place you plant near cold drafts or excessive heat. Avoid placing your plant near appliances, fireplaces or ventilating ducts. 2. Poinsettias are sensitive to cold, so avoid placing them outside during the winter months. 3. Don’t over water your plant, or allow it to sit in standing water. Always remove a plant from any decorative container before watering, and allow the water to drain completely. ~~ After your Poinsettia has bloomed, cut it back. ~~ When the weather is warm enough so there is no chance of freezing, take your Poinsettia outside. Water and fertilize it normally through the summer. ~~ Approximately 8 weeks before you want your Poinsettia to bloom, start giving the plant 14 hours of total darkness each day. Water and fertilize like normal. Don’t be disappointed if your Poinsettia does not look as nice as when you got it originally. Typically, commercial growers have ideal conditions that enable them to grow such compact, high quality, colorful Poinsettias. special needs child. She is moderator of “Gardening and the Outdoors at Baby University, an online parenting community.